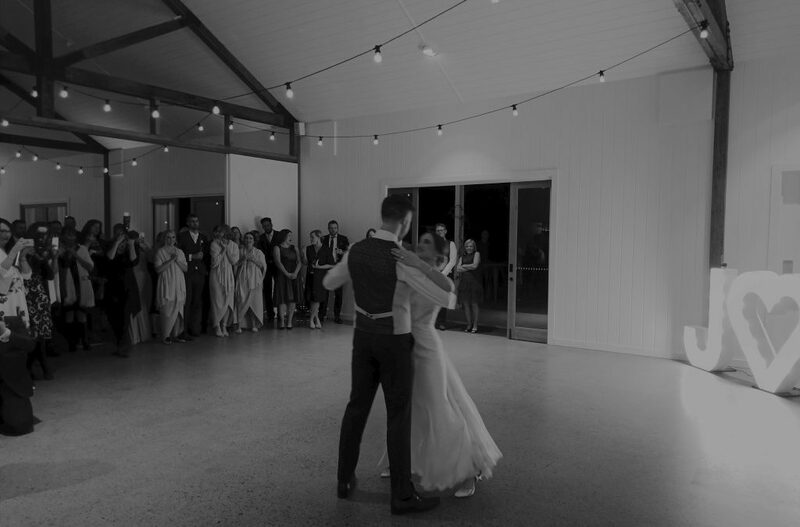 Winter weddings are the best on the Gold Coast in our opinion! The days are generally beautiful and sunny with no clouds. The winter weather is warm enough here on the Gold Coast during the days to not be uncomfortably hot or cold. Then as the sun goes down, everyone moves inside where it is warm and cosy. Winter weddings are amazing! The wedding for Yolanda & James on the 14th of July was no exception. Everything was perfect. Their ceremony on the hill at Summergrove was in the wonderful winter sun and the view to the beach was breathtaking. The guests arrived whilst we provided some ambient music to set the mood as they awaited the arrival of the bride. When she arrived, the guests were swept away with how beautiful she looked. Yolanda chose to walk down the aisle to a fantastic reworking of “Feels Like Home” by Matt Johnson. After a beautiful ceremony by the celebrant Annie, they signed the registry to the tunes of “Teneriffe Sea” by Ed Sheeran followed by the acoustic version of “No One” by Alicia Keys. Then it was time to announce them as husband and wife and they proudly walked down the aisle as everyone cheered to the tune of “Marry Me” by Jason Derulo. Guests mingled for a while and got some great photos. Then it was time for them to all move down to the barn area to enjoy some canapes, drinks, tunes and mingling with each other whilst they awaited the arrival and the bride and groom. When they arrived back, they walked into the room to “Love On Top” by Beyonce as people raised their glasses to their arrival to the party! Guests then continued to mix and mingle whilst enjoying more tunes to keep the atmosphere alive. The couple definitely wanted a party vibe at this wedding, so there were no slow or romantic songs. It was a party! James & Yolanda cut their cake to the tune of “Kiss Me” by Sixpence None The Richer. Their impressive bridal dance (which they had choreographed) was to the classic strains of the great Frank Sinatra singing “The Way You Look Tonight”. Very classy and elegant indeed! Then everyone hit the dance floor and danced the rest of the night away! Thanks so much for allowing us to be a part of your day!